Over the past year, I've been a part of a few online piano teacher forums. These forums have been a great source of encouragement, inspiration, and networking. Sometimes, advice is sought out, and I've noticed that some questions are consistently asked over and over again. One of these questions is: "How can I help my student become better at reading notes?" While nothing can beat daily focused practice, I've found five resources that have been incredibly helpful (click on the titles for information about each resource). Students can race to the finish line as they correctly identify flashcards. The custom settings make this app useful and engaging for students at all ages and levels. I highly recommend using this instructional series with your students. 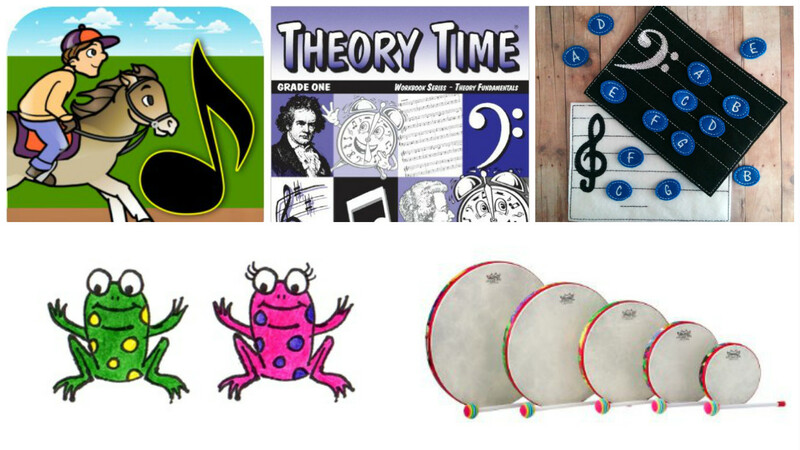 Each book is full of worksheets that introduce musical concepts in a clear, concise way, and regularly repeats and reviews that information until it becomes a part of each student's musical core. Some students are kinesthetic learners, meaning that they excel when they are able to engage in a lesson physically, rather than aurally or visually. The physical act of placing these letters on the correct lines or spaces seems to really help my students remember note names. Most children learn best through play! I believe that games are an essential part of every piano lesson. Right now, I've been using Greenside Music's Music Olympics games during our studio challenge . These games are very popular with my young students! I use hand drums, rhythm sticks, or egg shakers at every lesson. When a student begins a new piece, we always tap through the rhythms together with percussion instruments. Then, we'll tap through the rhythms a second time, and read the note names aloud. This process helps the student master difficult rhythms and ensures that they've read through the music before attempting to play the notes on the piano. What resources do you use to teach and review note-reading? Share your thoughts in the comments!